If you think that stone garden decorations couldn’t impress you we will do our best to change your mind. 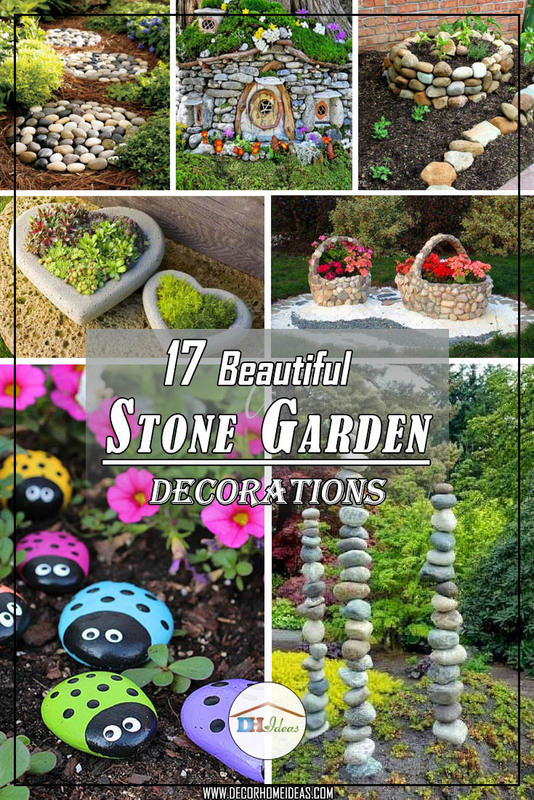 Following selected decorations are so creative and amazing and in the mean time so easy to recreate, that by the end of this article you would be thrilled to get some for your backyard or garden. 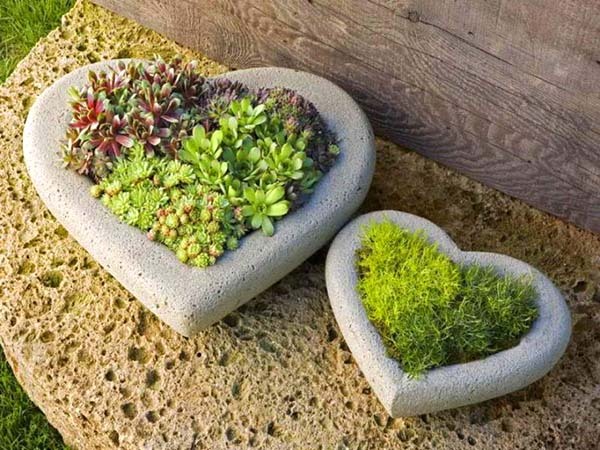 If you love planting container gardens but don’t know how to start, see how containers can be designed beautifully in stone hearts. Stars, all bright and beautiful are always glimpsing down the earth to see the beautiful gardens. Sounds like a fairy tale? Well, it is not. Believe it or not, the Gods love to see our gardens. There is so much beauty in these heart-shaped flower planters and so much life inside the green colors! Sometimes, for a moment or two, we simply wish to experience the bliss of living. We want to feel the formidable forces of creation and what transforms them right before our eyes are the beautiful plants. It doesn’t matter if you are in love or not, heart shaped garden decorations are always a good choice when it comes to landscaping design. We have been graced with so much. So much to be thankful for! 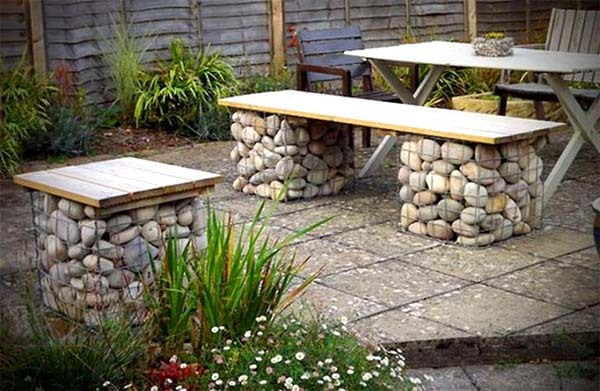 Stones can be found in different sizes and shapes and thus can be also used to make some backyard furniture. The bigger stones can be arranged in the shape of seating and thus serve as a bench.Blue tranquility, peace, and stillness. I am an avid reader and a writer, so to me, gardens are possibly some of the most magical places on Earth. Sitting still in a garden is worth to me a thousand dimes, a million bucks and the applauses that all the greatest performers have received in the world. What amazes us are not the loud, buzzing compliments or even the adoration of others. What makes us feel and wonder is the simple beauty of existence. 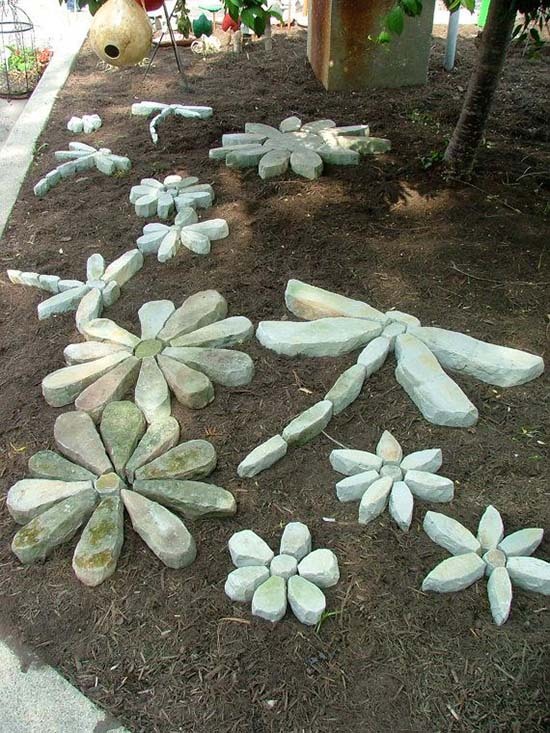 If you can shape the stones and rocks then you can create beautiful dragonflies and flowers. You will need flat stones to make them easier to work with. That dark hemlock mulch looks really great between the green grass and the stones. 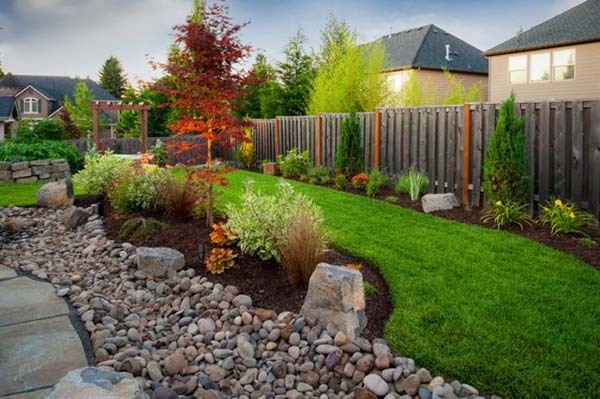 Landscaping is a precious form of art, a way of expressing oneself through the creations of nature. 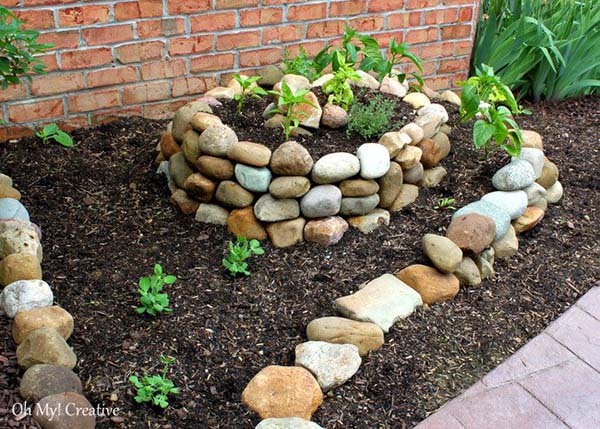 Stone gardens are naturally a source of inspiration. 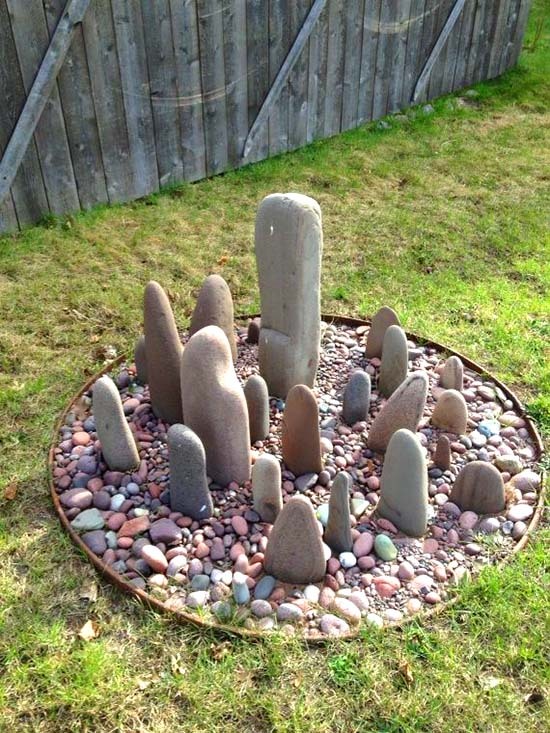 There are so many ways to design a stone garden, so many shapes and forms. It is all about the stones and the fresh grass. There is also one more special part, a unique addition to the story – it is the patience to grow the plants of your dreams. Without that, all of your gracious endeavors would not suffice. Stones drilled through center and stacked with pole running through the center. 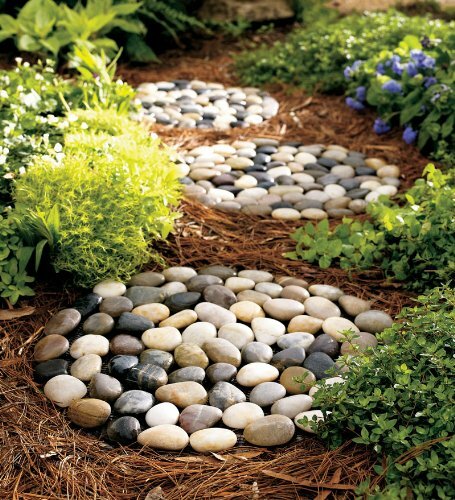 Pebbles spruce up landscaping ideas and give a distinctively modern feel to gardens and backyard designs. So why don’t we make a rock bench? It’s not so difficult. 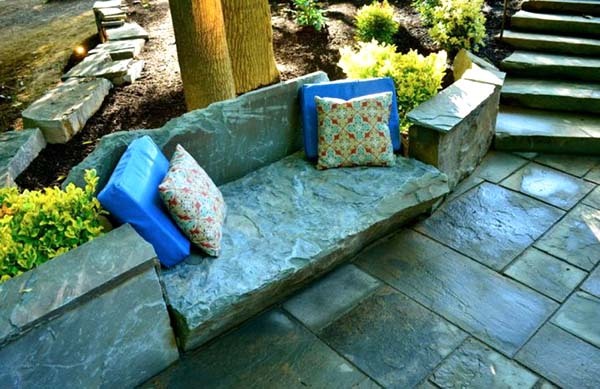 Benches made entirely out of rocks and stones, are something we have inherited from our ancestors centuries ago. It wasn’t unusual to build those back in the day. In fact, they were so common – like the castles, the kings, and queens. They are the perfect spot for relaxing and feeling the oneness of this world. Sometimes a park bench becomes a strategic spot, a symbol much like the whipping top in “Inception”. A place to go return to, to feel settled within oneself… It’s the mark where events circle back to and become whole. A sweet little Stone cottage to grace a rock garden. The house will take several days to complete. But it’s so beautiful! Up next is a real magical land of gardening! 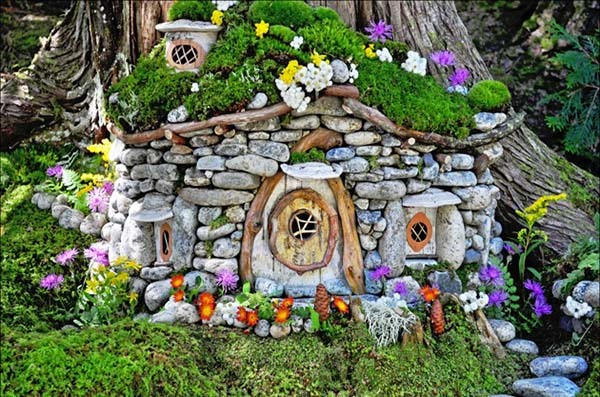 This stone cottage is something to be admired and it looks like it came from an enchanted story. It’s an example of a perfect cottage garden layout. Isn’t it amazing that such beautiful places exist on Earth? They say beauty is in the eyes of the beholder, but this house is a beauty, too. This is the place where you grab a Popsicle, play Celtic music and sway, dance around and let your worries fly away. We are definitely not speaking about design here anymore – there is an infatuating experience to be craved. You can create any size and any color. Choose some nice and smooth stones and combine them with the smaller ones. We use to associate baskets with candy. These flower beds are a different take on making the best of this practical design. Stone basket planters are another way to design a stone garden. It is a miraculous treat for us to have a park or a garden like this. The planters are like boats for the flowers. All gorgeous, alive and blooming – flowers make us treasure and cherish the beauty in this world. 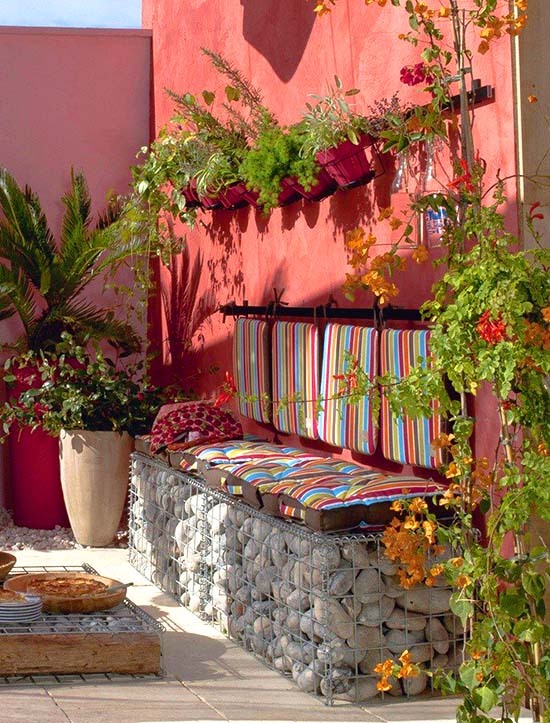 Go ahead and create these astonishing baskets for an amazing look of your garden area. 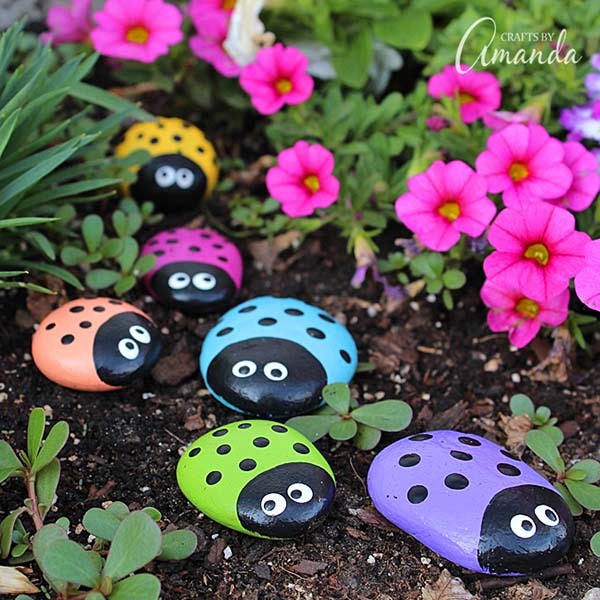 Painting rocks like ladybugs could be fun and is also very beautiful addition to any garden decor. 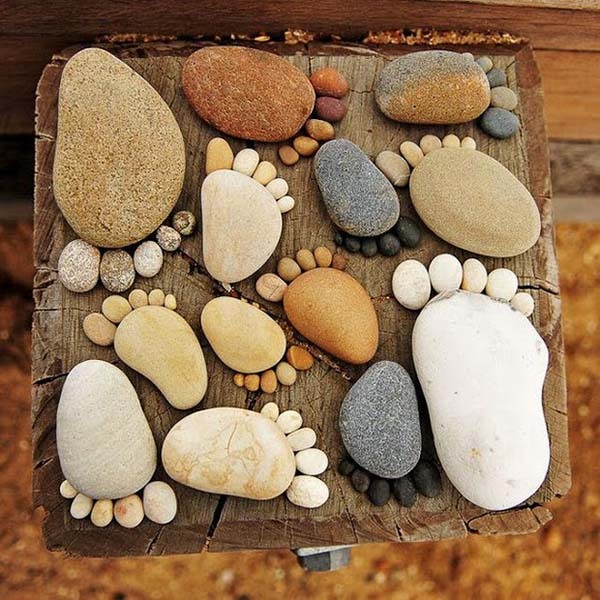 These beautiful stepping stones could be bought from Amazon at a very good price. Gabion is a wire cage that is filled with stone or other hard broken substances. They can be used in and around your home. What about original garden furniture? Gabions are particularly astounding structures. They are an interesting part of engineering for open spaces. There is so much originality in this garden furnishing. Just as spring awakens and starts a new cycle of life in nature, we get to share some of the interesting structures made of stones. As a matter of fact, the more I look at them, the more I realize how properly they would fit almost anywhere. Spruce up the place in a unique way and let your imagination float, flourish and enjoy these beautiful structures. 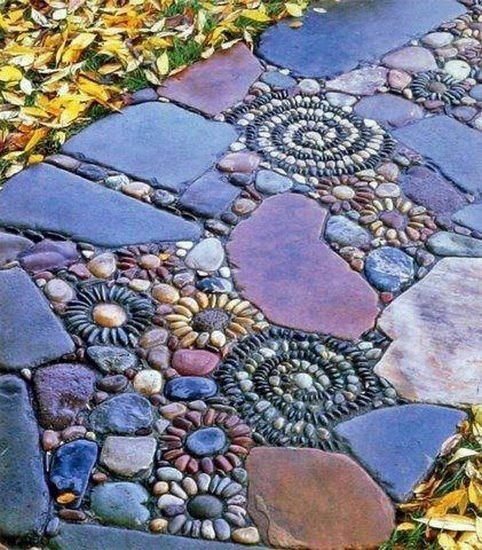 Creative mosaic made of different stones and pebbles. 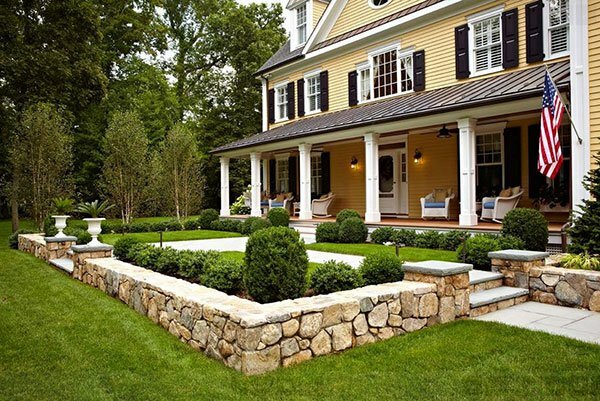 Another front yard landscaping idea with lovely stone curb appeal. Front yards are the ideal places to create something out of the ordinary, something gorgeous – a state-of-the-art piece. This landscaping idea is about a rectangular shape made of stones. Such a beautiful place to be. The rough stones are turned into a soft remarkable shape in the yard. They elegantly enhance the effect of the house architecture and underline the importance of a beautiful front lawn. If you are willing to dedicate a certain part of the budget for it, it will be well appreciated for years to come. 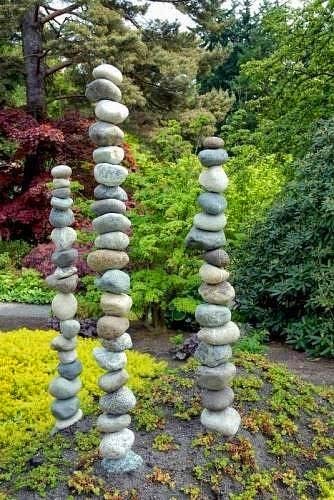 Stones can be used to create versatile garden decorations and can be arranged in the way you like. 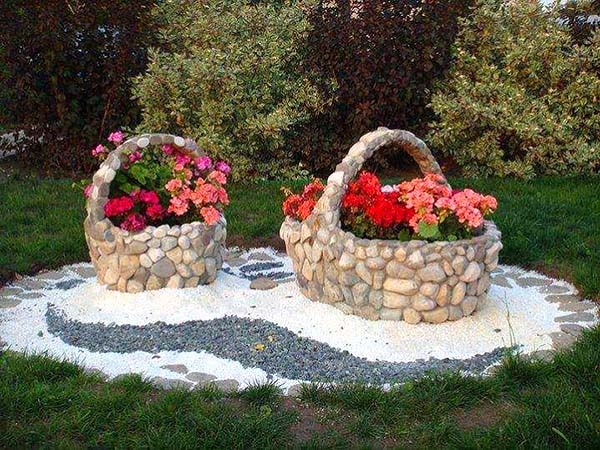 You just need to be creative and use this natural material to beautify the garden. There is an array of spiritual definitions of the shape of the circle. It not only represents a life form but is said to create a sacred space where you are protected. 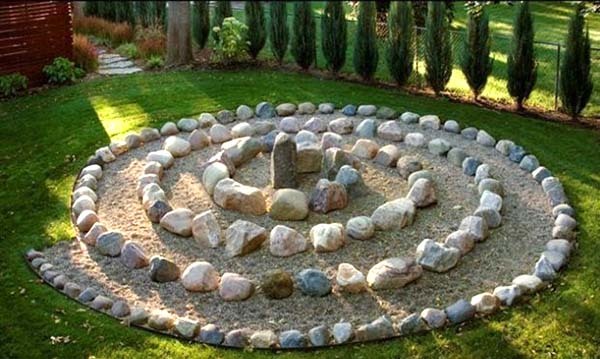 This is probably one of the easiest shapes to achieve with stone gardening, but it has a deep meaning in spiritual practices. Celtics used the circle for protection, for example. The circle includes both the feminine and the masculine principles, so it’s not about gender or preference. It is about inclusiveness and the creation of a sacred space. Another great idea would be to use it as an Herb garden. They are so easy to grow. Not much work. My last choice would be a simple divine garden that is a home for plants, vegetables, and small fruits, if you wish. Spending a good thirty minutes every single day will make you more grounded, harmonious and vibrant. Plus, you get fresh produce all the time! Having your own garden is invaluable! Taking the time to break through the same patterns of habits sometimes requires effort. It’s best if we do it with activities that are easy to love and adore, such as gardening at home. If you liked this article, please SHARE with the buttons below or PIN it for later.